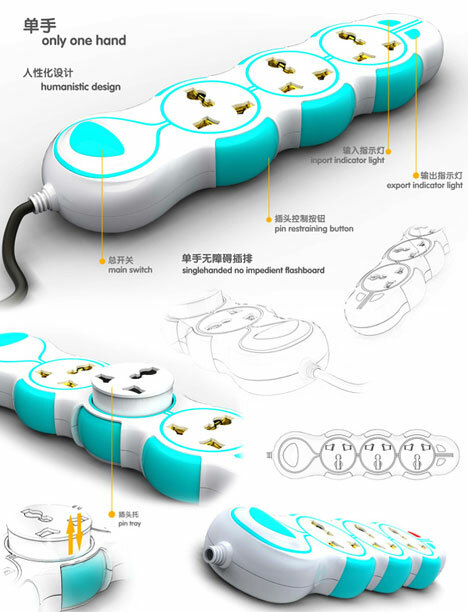 If you’ve ever gotten a nasty shock from misplaced fingers while trying to unplug some gadget or another, you’ll appreciate this innovation in power strip design. The Single Hand Socket is designed to keep your plugs safely and neatly in place until you’re done with them – then you simply push in the tabs on either side and the plug pops up so you can grab it without frying your fingers. Maybe it’s not a very common problem (because most people are smarter around electricity than this editor) but the little shocks do happen – and besides that, tugging on a cord to unplug it when you’ve only got one hand free is just plain bad for the cord. 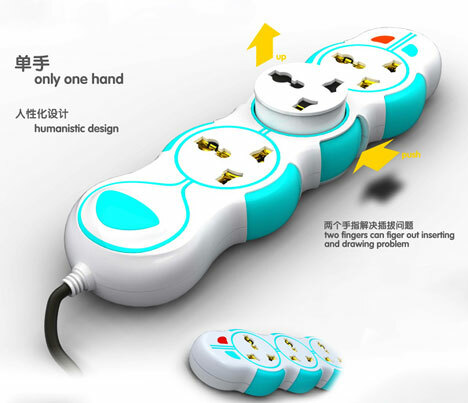 Designed by Lu Zhaoliang, the Single Hand Socket is an exercise in common sense and basic-but-brilliant design. 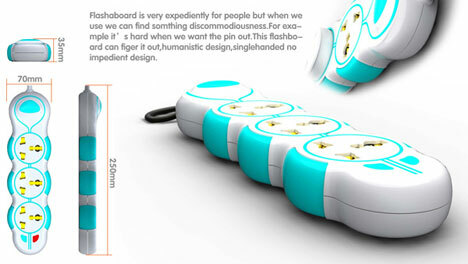 Although we aren’t sure what flashboards or discommodiousness are (see designer’s comments on pictures above), we would love to see this design make it out of the rendering software and into our offices someday soon. See more in Unbuilt Concepts or under Technology. March, 2011.